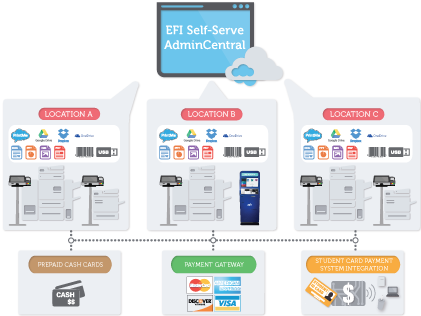 EFI™ Self-Serve AdminCentral, a cloud-based management portal, works with the M600 station, as well as EFI PrintMe web service to offer an affordable self-serve copy and print solution. It features minimal IT maintenance costs. AdminCentral enables central control of M600 stations located in multiple sites, and managing card authorization services of the devices. From anywhere with a web browser, AdminCentral allows an administrator to monitor and manage transactions involving credit, campus and cash cards; plus provides a convenient way to configure and maintain the system. Easy to use and manage from anywhere. Low barrier to entry with minimal maintenance cost. Quick status checking and reporting right from a web browser.